Sisters, mothers, and dreamers are unique in their ability to inspire, encourage, and change the world. For over a century, Louisa May Alcott’s LITTLE WOMEN has been one of the most endearing families in literature, motivating women of all ages to dream together and celebrate family. Just in time for the 150th Anniversary of Alcott’s beloved novel, comes the nationwide theatrical release of the first modern version of LITTLE WOMEN! 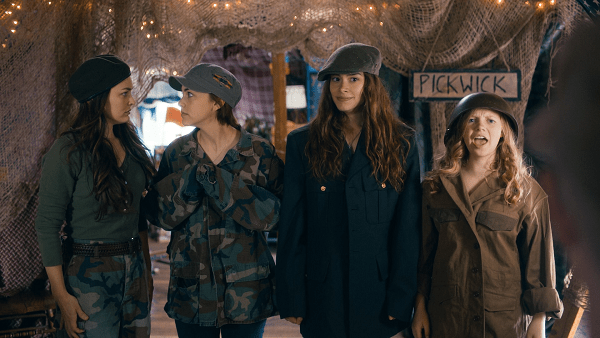 This fresh adaptation was made for a whole new generation of sisters and friends, and yet it maintains the sensibilities of the original story. Niederpruem’s gently updated version of LITTLE WOMEN was obviously made with respect and affection. It’s much better than a lot of modern retellings of classics, and can be enjoyed whether or not you read the book. I don’t even have any sisters but I love both the book and this movie! 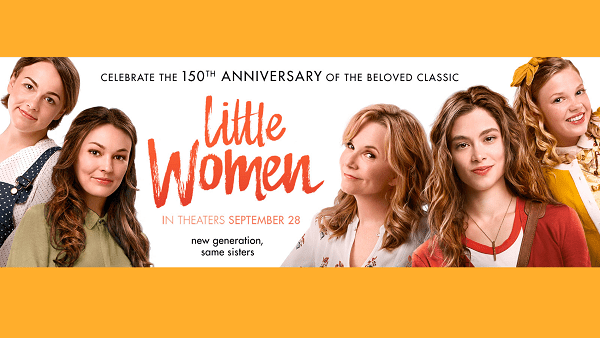 LITTLE WOMEN follows the lives of four sisters – Meg, Jo, Beth, and Amy March – detailing their passage from childhood to womanhood. From girls playing in the attic to women living with purpose, the March sisters are committed to always supporting each other. As they mature, they face difficult times as well as blossoming ambitions and relationships, while maintaining their optimism and their unbreakable bond as sisters. Yet, growing up sometimes means growing apart. An aspiring writer, Jo leaves for New York determined to publish a novel. In the wake of rejected draft upon draft, her editor challenges Jo to write about something more interesting—her family. When tragedy brings the sisters back home, sticking together takes on new meaning. As Jo comforts her sick sister, Beth asks for one thing: a story. Jo knows the perfect one … by heart. 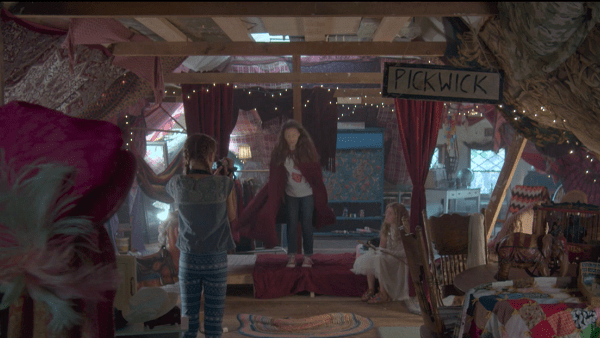 A feature film about homeschoolers, yay! It starts out with a home movie of the girls putting on a play. 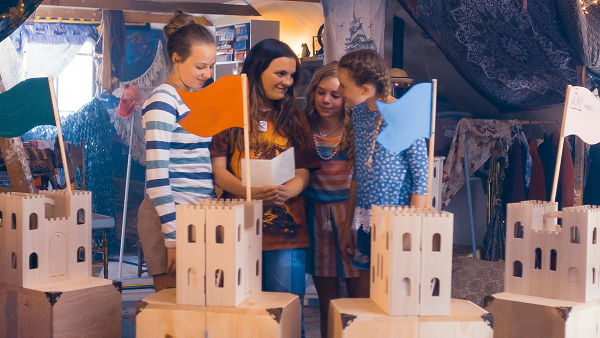 The way they act and have their attic room decorated, if you are homeschooled you can tell right away that these sisters are kindred spirits with their arts, crafts, literature, creativity and imagination. At various points in the movie they are shown reading Pilgrim’s Progress and The Mythical Creatures Bible, and doing a re-enactment of a scene in Pilgrim’s Progress as well as a dragon story. This movie was former costume designer Clare Niederpruem’s directorial debut, and she sure made a good first impression. I love the girls’ room, it’s so gorgeously detailed! Incidentally, the cinematography, costumes, and set design all have a woman’s touch – as do the writing, production and editing. (Meet the women behind LITTLE WOMEN here.) I’d love to see a book about the making of LITTLE WOMEN, just like they did with The Making of Pride and Prejudice. The plot of the LITTLE WOMEN movie is propelled by a series of flashbacks showing pivotal times in the lives of the March sisters. For a while in the beginning, the movie was a little hard to follow because of the way it kept jumping back and forth from past to present, but by the end it knit together nicely. The story is told from Jo’s point of view. Jo is an aspiring writer, outspoken, imaginative, and ambitious. Meg, the older sister, flirts with boys but longs for marriage and family. Beth is the shy third sister, who loves music. The youngest is Amy, an aspiring artist who dreams of being rich and beautiful. They meet the boy next door, Laurie Lawrence, an orphan who has come to stay with his wealthy grandfather. The crusty Mr. Lawrence hires a young man as a live-in tutor. Parts of this movie reminded me of the anime “Special A,” about gifted kids who hang out in a conservatory and do interesting things together. As a teenager, Meg wants to break out from being a “weird homeschool kid,” but in the end she settles down despite her rebellious nature. The same with Jo, the tomboy with anger issues. Admittedly, she is the one character I can totally relate to! It may seem odd in this modern version that Jo writes the old-fashioned way (in a blank bound book) instead of typing directly into the computer, but it’s not much different than keeping a diary or writing a journal by hand. (Personally, I wish I had handwritten copies of the poems I wrote that were lost forever when my computer crashed!) Plus, it’s not really that farfetched when you consider the strange habits of famous writers. Lea Thompson (BACK TO THE FUTURE) does a fine job as Marmee, the matriarch of the family. They didn’t even mention Papa March at first, or explain why Marmee is at home raising their four daughters without him. 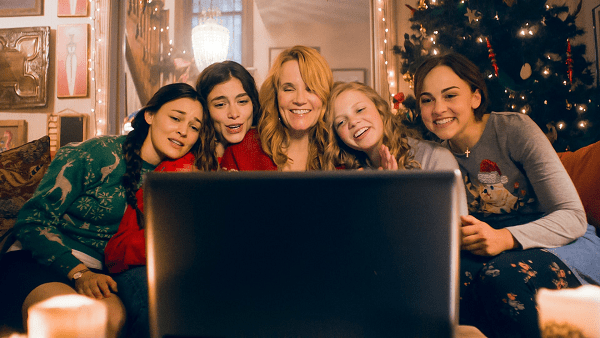 But later in the movie, the March sisters and their mom gather in front of the computer to talk on Skype to their father, who is wearing desert fatigues, so he must be stationed in Iraq or someplace like that. In another nod to the military, the girls have their own military-themed club. Jo, her sisters, and mom are all strong female characters, and their male counterparts are nice and gentlemanly. The whole movie was tastefully done. It’s not a religious movie, but they sing traditional Christmas carols and the characters have good morals. That being said, there were two parties with underage drinking, and at one of them there was a scene in which a guy and a girl started making out. But they were fully clothed and when the girl wanted to stop, the guy respected her wishes (while walking away angrily). For the most part, though, I kept thinking that the wholesome values and interactions between guys and girls in this movie had the feeling of a Hallmark or Mormon romance (though with a more talented cast and better production quality). Incidentally, the credits show that LITTLE WOMEN was filmed in Salt Lake City, Utah! Locations include the LDS Hospital Simulation Center, Historic Wesley K. Walton home, James Fletcher building, John R. Park building, West High School, Weller Bookstore, University of Utah, and The Grand Theater at SLCC. This was a great time of year for LITTLE WOMEN to come out, with its autumn and Christmas scenes. 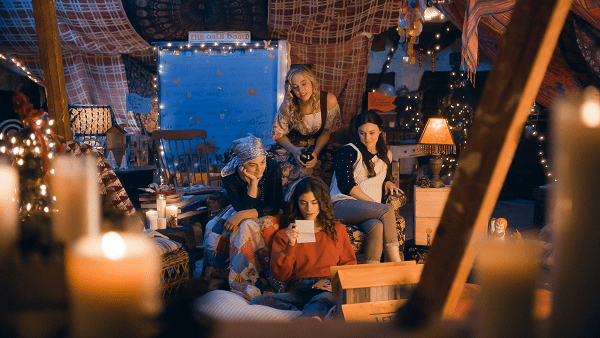 It’s a must-see for homeschoolers, aspiring writers, and anyone who loved the book – and, of course, you must watch it with your sister(s), friends, or family. Visit the official film website here. Get ticket info here. How did you like the movie? Leave your comments below!